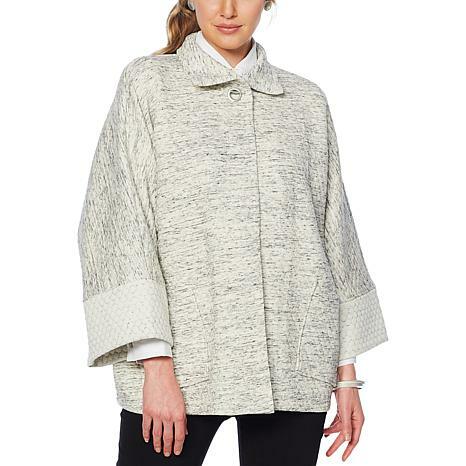 Effortless and cozy chic, this topper stimulates style no matter what you pair it with. Top it over leggings, denim jeans and all your fitted skirts. Absolutely love this jacket. It's true to size, I wear a large. Adorable jacket. Bought in black and I have received lots of compliments!! Highly recommend!! It is so sophisticated and the material is comfy. I feel as if I am in a cocoon love it! Bought seafoam and black in my normal size large, fabric is soft and comfortable, I can see this my go to jacket when dashing out the door to go run errands, love how Marla makes jackets and shirts, sweaters ex... With the larger sleeves because I am built with larger arms and shoulders so fits very comfortable with ease of movement.